Do you hate it, too? 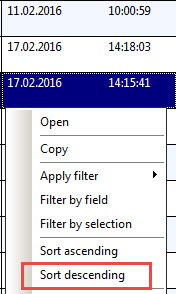 You’re working in a grid with many columns, you scroll to the right to find the column you want to filter. You enter the filter, hit return and the grid jumps back to the first column? Here is why: The focus is still on the first column. After applying the filter, this column is therefore brought back into your view. This also leads to the solution: Before filtering, click into the field of interest (maybe the column you want to filter). Now, the grid won’t jump any more to a position you don’t care about. If you work in a system for some time you learn tricks that make it easier to use that system. Usually, you don’t even realize that you use them until you watch a new user and ask „But why don’t you …“. So I thought I’d start a collection of some of those tiny tricks I use in AX very often. I will add to the list as I go along in my projects and notice something that might help new users. If you navigate within a form and use the tab key, you will realize that the current value in the control is preselected. You can then directly type in the value you want to enter because the old value is automatically overwritten. You can use any editable number control in AX as a calculator. Try it out. You might find it useful from time to time. The new HTML5 client has a very clean, modern look. All the colorful action pane icons that were new in (AX2009 and) AX2012 are gone again. We see a “responsive design”: When you resize the window (manually, or use it on a device with a different scale), the control are reorganized nicely. All in all, the rendering / building of the forms seems to be a lot “calmer” than before. No flickering, no superfluous repaints. Dynalink / “follow-me” functionality is still available: From a list of records (former list page), you can still open a second (third etc.) related form whose content follows the record selection on the main list. Dialogs that open from a form, will “slide in” from the right side and cover a bit of the main form: This would be, f.ex. the dimension / offset dimension form on a general ledger journal, the dialog for posting a journal etc. One AX HTML client session can only have one main window! If you need, for example, the list of relevant purchase orders, the planned purchase orders and the invent table and stock on hand, you’ll open three AX sessions. Important to note: Microsoft is going to limit the number of sessions a user can open! Someone asked me today what the DAT Company in AX2012 is needed for. If you Google, you’ll read that it contains „Setup data“, but I think that’s not really true. What could that Setup data be? Company dependant functional setup, like CustGroup, SalesParameters, is stored in that specific company, so that can’t be it. Company independant setup, like SystemParameters, NumberSequenceTable, EcoResAttributeType, is stored without a „dataAreaId“ column, so that cannot be it. Die Cookie-Einstellungen auf dieser Website sind auf "Cookies zulassen" eingestellt, um die Inhalte bestmöglich zu präsentieren. Wenn Sie diese Website ohne Änderung der Cookie-Einstellungen verwenden oder auf "Akzeptieren" klicken, erklären Sie sich damit einverstanden.